The text below is based on our experiences and are our views. You may take or leave our opinions as you find them! However, we have tried to be as objective as we can. We hope it helps in your planning. All pricing was correct as at Jul 16. Immigration and Clearing in. All immigration services are carried out at the Gendarmerie offices. We have met a few policemen and women here and all have been unfailingly courteous and helpful. Make sure everyone from the boat goes to the Police station. They need to see everyone and identify them against the passports. We Europeans (for however much time is left us Brits can claim that status, I don’t know!) get it easy going into French Polynesia. We turn up, fill in a single page form and 15 minutes later, that is us free and easy for the next 18 months without any drama at all. No agent required. The rest of the world have a bit more difficulty and you require a visa. The long stay one (strongly recommended – you need this if you are going to explore even a small part of French Polynesia) is a bit of hassle to get. The best place to get the visa is, we have been told, when you are in Panama itself. The Embassy there is used to sailors trooping through and you are not a novelty. Advice would be to sort the visa whilst you are there. Signing up for the Pacific Puddlejump gives you credibility as well. When you arrive, you may find it easier to use an agent, either via the Pacific Puddlejump links (strongly recommended) or directly to an agent to ensure that you can hand on responsibility of getting either the bond or the proof of an airfare home. Note home means home nation, not to the next country in line. We met a S African girl who unfortunately hadn’t done her research and was looking at $5k for her ticket. The bond is the better option but it costs 10% of the bond in “admin fees” so your best bet is to use an agent to deal the hassle. I think the Puddlejump crowd via their preferred agent, get a block discount which saves a good amount of cash as well. You can book in at Hiva Oa, Ua Poa and Nuka Hiva. However, Fatu Hiva the SE island of the group is often the first stop in for yachts as getting back down to it can be difficult against the Trades. The officials down in Fatu Hiva have yet to report a yacht stopping in with them first. One comment I have heard is the person responsible for letting the Gendarmerie know about an arrival feels that doing so would be outwith Polynesian courtesy and welcome and therefore doesn’t! As long as you don’t kick the arse out of it, you should be be able to visit Fatu Hiva as a first stop. I’ll caveat this by saying that it only takes a change in official for the rules to be more strongly enforced, so speak to people on the S Pacific Magellan Net before you reach the islands and confirm this data is still accurate. The official courtesy flag is French. We started with that then the Marquesas Island’s own. This is preferred by the locals. 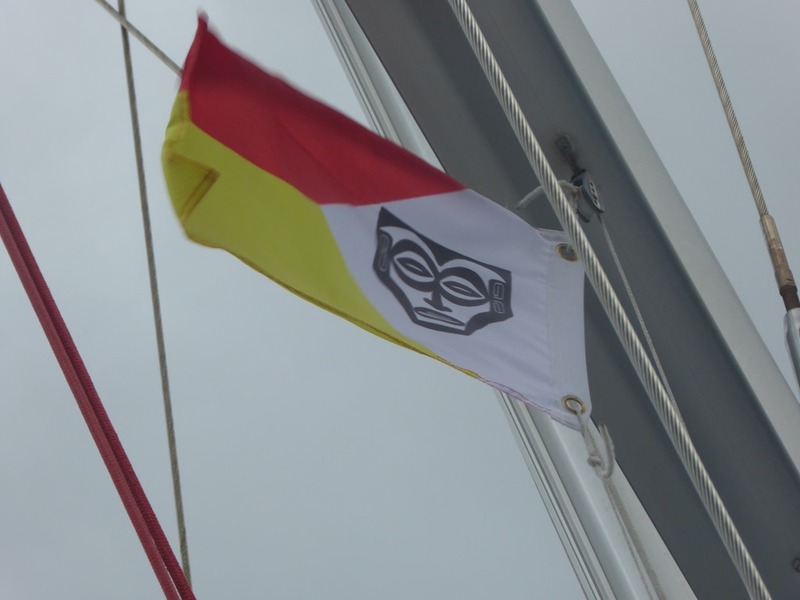 The only place I was able to find a small courtesy flag type within the Marquesas was at Nuka Hiva which we bought for 1000XFP. I think it would be an easy one to make up yourself if you had the time and inclination. Note – When arriving in to the Marquesas, you have three days grace before you need report to the Gendarmerie. Customs. There are Customs here but very few people ever meet them as there is only one boat covering the whole of French Polynesia. You will not meet them as a matter of course on entry. The declaration paperwork you fill in at the Gendarmerie has a box for alcohol, tobacco, drug and firearms declarations. Fill it in accurately even if you are over your limit and use the term “Ships Stores”. The Gendarmerie simply want the box filled out and unless it is firearms related, they take no further action. If you have lots of undeclared booze on board and you do meet with the Customs Boat, expect them to take the view you are trying to sell it to the locals. You will be, at best, fined heavily, lose the booze and get kicked out of the country; worst case, they can impound your boat. If the booze is declared properly then the worst they can do is hit you with an import tax. However, I have yet to meet or hear of anyone this has happened to this season. “Ships Stores” seem to work. Agents. There are two that we know of in the Marquesas, both representatives of a Tahitian firm that if you planned well ahead, you could probably deal with directly. Sandra works in Hiva Oa, Kevin is at Nuka Hiva. A warning on Sandra. We twice failed to get a tax free fuel certificate from Sandra. We tried on our first visit to get one organised but the lead time Sandra gave us of “maybe one week” was too long. On our second visit, having tried to track her down for four days with missed appointments and no shows, we eventually managed to catch her on Bastille Day, getting the promise of the certificate two days later. Sadly when we met to collect it (she turned up 45 minutes late), she informed us that one document had been difficult to read and we needed to give it to her again. Asked when she had known this she said the morning of the day before. She simply smiled and shrugged when I asked her why she hadn’t phoned straight away to get the problem fixed. Asked when we would now get the certificate, she said maybe Wednesday, a further 5 days ahead – a total of 10 days from start to finish of process. It takes 30 minutes in Tahiti. The woman is singularly useless, difficult to track down and very unreliable. It doesn’t even seem to be an island time problem; just uncaring laziness. This is not just our experience. We have had horror stories from a number of other boats we have met. From those that we have spoken to who have contracted her, they often wait for several days after they arrived for contact to be made and often are made to wait for her to complete clearances. Five days was the longest we heard about. I think the worst we heard was from Dragonbane who used her for laundry. They got back a wet but unwashed and slightly smelly pile with a comment that she hadn’t had time to finish it. Not professional. I’d strongly suggest if anyone does need an agent in the Marquesas, try Kevin up at Nuka Hiva. He, says people that have used him, can be relied on to communicate with you, can be used as a postal address, can talk boat parts and will help source too if you need stuff sent in from Tahiti. Vincent, who started the new yard in Hiva Oa this year (2016) is looking into providing an agent’s service too. It may be worth checking in with him to see if he is offering the service in competition to Sandra. Haul out Facilities. You hope you won’t run into problems on your crossing. However, some do and we were one of them. The new haul out and yard services at Atuana, Hiva Oa saved us a world of hurt and our ability to tour FP effectively. Please read our separate blog post on our experience with the yard. A link is HERE. Pets. For those that have pets on board, French Polynesia is not an accommodating place. Unless you are willing to wait through a six month quarantine and pay the high fees for this, pets are not allowed on shore. It doesn’t get any easier as you head out of FP West either so think long and hard to see if you are happy never being able to let your pet off the boat. Stocking up. We have been very pleasantly surprised at what we have been able to source at a reasonable price. France still subsidizes food here and the import of good French cheese, pates and fixed price bread at 50cents a baguette has been wonderful. There is good shopping on Hiva Oa, Ua Poa and Nuka Hiva, each with at least two supermarkets with some variation of choice. Fruit and Veg – You need to get in quickly after the boat gets in which happens every couple of weeks. The best stuff goes quickly. Fruit can be easily had just wandering the countryside and if you can’t find it in the wild, you will pay little to a local for a great deal of local variety fruits. Apples are more expensive as they are shipped in. Other than a little bread fruit (for which you need to trade with a local for they aren’t in the shops), vegetables are shipped in and the selection is basic. Cabbage, potatoes, onions, carrots and occasionally leeks seem to be the basic stock. I was amazed to find Pak choy in the market by the pier in Nuka Hiva one day. God knows where it had come from. Meat – All meats are frozen, are expensive but the quality is reasonable with most sourced from New Zealand. The sausages (proper French ones with a high meat content) are very good value and we have stocked up heavily on them. Bizarrely, most sea foods are routinely imported and are expensive. Fresh fish can be difficult to find. Ask at the pier, not in the store. We ran out of Heinz Baked Beans a long, long time ago. However, we found the best substitute we ever have here in the shape of Libby’s Pork and Beans. And it is a red label good!!! No corn syrup present and 220XFP a big can. Eleanor and I are in heaven even if I am made to sleep “elsewhere” the night after eating them. All Chinese goods are very cheap. Don’t bother with soy sauce, Greg! I suspect they are massively subsidised by the Chinese who are working hard on the Marquesians, trying to get them to accept the offer of fast internet for fishing rights around the islands. Household cleaning products are expensive and there is a basic choice of most items. For those wanting to do ammonia clothes washing, strongly recommended if you want to save water, stock up in Panama. You won’t find any here. Alcohol. Wow. So expensive. Prices here are $US for ease. A can of beer is $3-3.50. The local gut rot rum is $25 a 70cl bottle. Famous Grouse (a basic whisky) – $70. Gin – $60-80. Wine – starts at $15 bottle and goes rapidly up. What you’d pay $10 for in the UK is $30+ here. Mixers are very dear and are very limited in choice. Can of coke or anything fizzy – $2. Make sure you stock up well before you reach here. Communications. Due to the distances involved and the huge hills of the islands blocking signals, VHF does not work well. HF is very popular and we have used the morning check in on the South Pacific Magellan Net, run from Tahiti, to keep up with friends, ask questions about the islands and to let the net know where we are. We have heard people reporting in on route to New Zealand on the other side of Niue, more than 2000miles away. We use the evening net only if we are doing overnight passages. BBC Word Service 6.195MHz from 2300-0700hrs local – best around midnight. Best for international news. Radio Australia 9.580MHz from 2200 – 0930hrs local – excellent service in the morning hours. Good discussion and topic programmes. News from ABC News, largely Aus focused. Internet isn’t the best in the Marquesas and it is expensive but you should be able to find service on all the islands. The roaming internet is provided by Vinispot or Manospot, with a few and regularly out of service hotspots. There is a map showing antenna locations in the islands on their website. Scratch cards are available at the Post Office at 480XFP for one hour or 2000XFP for five hours. For the best service, you need to find a Post Office and sit outside it. There are internet cafes on Hiva Oa and Nuka Hiva only and the normal price is 500XFP for the password. There is free internet at the Library on Ua Poa. The hotspot in The Bay of Virgins, Fatu Hiva is providing us with the best internet connectivity by far but only when it is working, which is rarely. Phone cards are available from the Post Office. Phone calls within FP are cheap and are all the same rate, no matter what atoll you call, great for organising ahead. The only issue we have is cards last only 15 days before becoming invalid so buy the smallest value cards you can at a time so you don’t waste money. We keep one as spare for that just in case moment. Data is expensive and whilst we looked at getting a data card, decided we would stick to the internet cards instead. You need to have a long term contract to make it worthwhile. Money and trading. The local currency is the XFP and it is pegged to the Dollar rather than the Euro. As of Jul 16, exchange is about 110XFP to $1. You will have great difficulty getting this currency outside French Polynesia. There are ATMs on Hiva Oa, Nuka Hiva and Ua Poa. To the amazement of USA citizens, dollars are rarely welcome here. The locals do not want the bother and expense of changing currency. Credit cards are accepted in some of the supermarkets, in a couple of restaurants and that is all. Check to make sure they take cards before you sit down or start shopping. Perfume, lipstick, hand cream, pretty much any female cosmetic (the choices here in the stores are very very basic), fishing gear, rope, dresses, kids clothing and shoes, T-shirts, .22’ cartridges (Fatu Hiva especially). Items commemorating your home country are said to be popular too. They aren’t very interested in cast offs. New products if you can for clothes. Cosmetic tester bottles would be a good trade item (and a good size) if you can get your hands on them. NOTE – if you are going in to the Tuamotus, there is one island only with an ATM – Rangiroa. Expect to require cash so load up in the Marquesas before you leave. Fuel and Gas. Fuel is available at Hiva Oa and Nuka Hiva. In Hiva Oa, it is from the gas station and you need to use jerry cans. In Nuka Hiva, better equipped for big ships, it is possible to tie along side the main dock and pump in there. Note tax free fuel is only available with a tax free certificate which will cost $130 (2016). It is valid for six months. It is worth getting if you are going to buy more than 55 gals in that time. They are available via the agents only and take some days to organise so plan ahead. My advice is to use Kevin on Nuka Hiva. He is more trustworthy and efficient. Current fuel cost is 130XFP per litre diesel and around 110XFP a litre for petrol. The tax free rate is about half of that. You need to supply the agent with a copy of your clearance paperwork, boat papers and a copy of your passport. Gas is only available in European fit 30lb bottles. If you use US bottles as we do, you can make you own gravity feed hose easily enough but you do need to bring a spare US adaptor to build one. You need to buy this before you reach Panama. A photo says a thousand words… Increase the length of pipe to get a better pressure flow. We borrowed the one in the photo and it worked after a fashion. Second time around we increased the drop height between the two bottles to 10’ and this worked far more effectively. A small set of digital scales to allow you to measure the weight of the bottles is an excellent idea and will stop you overfilling the bottles, which is dangerous in this heat. Gas is very cheap and a 30lb bottle is 3000XFP deposit and 2800XFP for a refill. 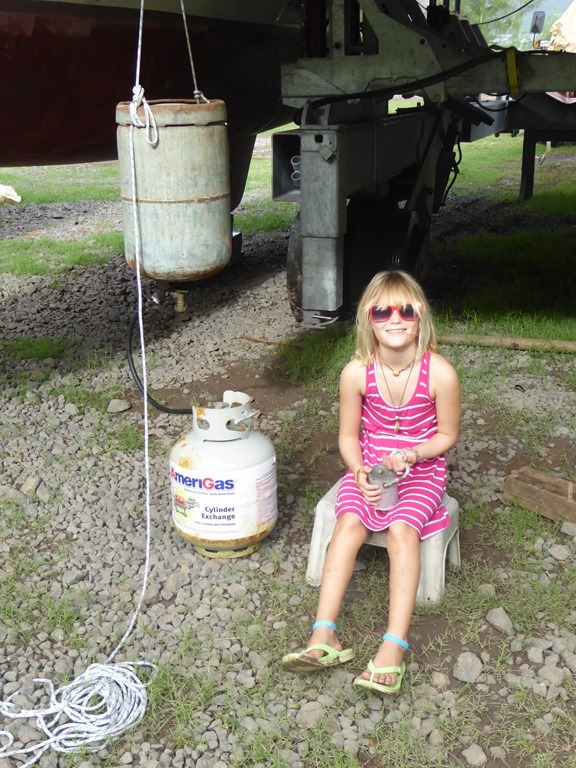 Pick gas bottles up at a garage in Hiva Oa or Nuka Hiva. Laundry. You can get laundry done here but it is expensive. Cost at Hiva Oa was $4.50 per kg. $4 a kilo on Nuka Hiva. Both services were via the agents. They are no self service laundromats here! We washed our stuff ourselves on the pier using the free water . It dries quickly too. Language. Polynesian and French are the two primary languages here. English, much as it is in France, is not common so get practising your French. The locals here are much more accommodating than in “real” France and will help you along with a smile as you try and explain yourself. Saying hello or thank you in Polynesian will get you a big grin. Getting around. Taxis are rare. There is one for the whole of Hiva Oa and the only time we got in to that, he didn’t charge us anything in way of apologising for being away on holiday the week before with his wife when we were trying to find out her prices for laundry! Hitch hiking is accepted. If you stick out your thumb here, you are more than likely to picked up by a local, even more so if you have children or a woman in the group. We hired a car, once, to explore Hiva Oa. Prices for a 4×4 Toyota Landcruiser will be around $100 per day and this price is common on all the islands. It is strongly recommended that you get a 4×4 (and know how to use 4×4 , hi and lo ratio)if you are going to explore. The roads out of town quickly become hard tracks and get steep. If it has been raining, you will need all the traction you can get. Mia and the Taranga crowd had an embarrassing night in the wild waiting for the road to dry up enough for them to move when on Nuka Hiva. They did say they got a good sunrise. The Route to Take. We have loved all the islands. Each has its own considerable attractions and each demands a visit. The only advice I would give is, if you are going to push through the islands with a limited time schedule, to look seriously at what route you plan to take before you reach the islands. The winds rarely drop below the normal trade of 15-20kts and the seas have always been S of E, normally ESE. Trying to beat back to the southern islands from the northern group is hard work. We lucked out with our windless passage back from Ua Poa to Tahuata – the only windless 36hrs in more than two months but we had time to wait and explore more than most people will. Doing this trip again, I would have arrived in at Fatu Hiva, then Hiva Oa, Tahuata, Ua Poa and finished at Nuka Hiva giving me the ability to stock up and refuel on the largest island of the group and a nice angle to reach down into the Tuamotus. But it all depends what you want out of the islands and how long you have to explore. We wanted to go slow and enjoy the people and the culture. However, our favourite place, Hanamoenoa Bay on Tahuata had neither of these. But it did have Manta Rays, white sand and peace in abundance. Whatever you choose to do, you will love it here. Thank you so much for this post! Enough detail to make me feel I can stock up on the right brands AND save money on the refuel! We just arrived in the med after a year in the West Indies but plan to head over to FP in a year or 2!